Honorary Grand Marshal for the Stronghurst Quasquicentennial parade is lifelong Stronghurst Citizen Jessie Norwood. 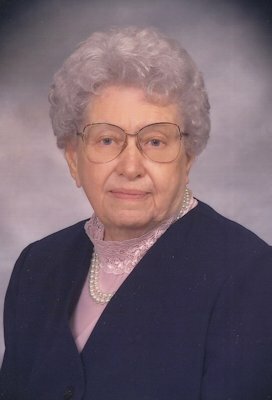 Mrs. Norwood past away on Thursday, June 21, at the age of 98 at the Oak Lane Nursing Home. She was born on November 18, 1913. Jessie attended early school at the Old Cox Country School, Stronghurst High School, and received her college degree from Macomb Teachers College in Macomb. After college, Jessie returned to Stronghurst where she taught school for the remainder of her working years. Jessie was married to Kenny and had two children, son John and daughter Nancy. Jessie was very active in her church, her school, and her community. Jessie liked to sit outside, listen to sports even though she never participated, garden, write and cook. As a life long member of the Stronghurst Community, we would like to honor Jessie for her vital contributions to our town.